This product is displayed for use by National Meteorological and Hydrological Services (NMHSs). It does not constitute an official forecast for any nation. top : Contours show 500hPa height in an interval of 60m. middle : Contours show 850hPa temperature in an interval of 3C. bottom : Contours show sea level pressure in an interval of 4hPa. 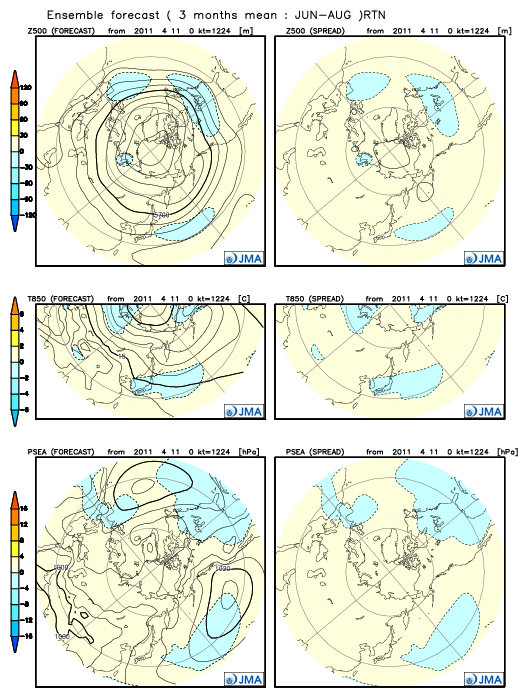 top : Contours show spread of 500hPa height in an interval of 30m. middle : Contours show spread of 850hPa temperature in an interval of 2C. bottom : Contours show spread of sea level pressure in an interval of 4hPa.